The sedimentary processes on Mars have generally been governed by wind, not water – but is this the case where the Curiosity rover is searching for life at the moment. If this is the case (and Curiosity will either confirm or infirm this when it reaches Mount Sharp next year), then odds are it won’t be finding any signs of Martian life – even if such life exists/existed on the Red Planet. Last August, Curiosity landed inside the 154-kilometre-wide Gale Crater. Its main destination was and still is the 5-kilometre-high sedimentary mound, Aeolis Mons, informally called Mount Sharp, which rises from the crater centre; at its base, Aeolis Mons contains clay and sulphate minerals which could have only formed in the presence of water – this made researchers believe that the sediments were once lacustrian. 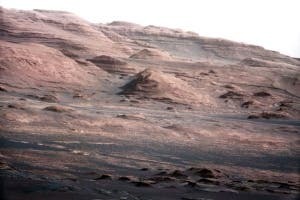 “If there were lake deposits on Mars, this would be one of the best places to look,” says Dawn Sumner, a Curiosity mission member at the University of California, Davis, who advocated sending the rover to Gale in part because of the possibility that it once contained a lake. However, a study conducted by Edwin Kite of the California Institute of Technology in Pasadena and his colleagues, published on 26 March, paints a much drier picture of the mountain’s formation. Using images provided by the Mars Reconnaissance Orbiter, he measured the orientation of rock layers exposed at a handful of locations around the mountain’s base. If it was a lake, you’d expect them to be as flat as it gets – but instead, they found that the layers were slightly tilted, by about 3 degrees. This figure, small as it may seem, is consistent with layers being formed by dust blown into the crater by wind. Of course, if you’re looking for life (as we know it at least), more water is good – so if this is a result of wind and not water, Curiosity could have a problem. Still, I find it hard to be convinced by the tilt argument alone; even if count out tectonic activity on Mars, there are other phenomena which can account for the tilt. For example, the asteroid that created Gale crater may have also formed a small central mound due to the ground rebounding after impact, which can be responsible for the 3 degrees. Other valid, but not quite as likely phenomena can also account for it. “There are other ways of explaining why the strata dip away from the mound,” says Gary Kocurek, a Curiosity team member and sedimentologist at the University of Texas at Austin. Either way, Curiosity will settle the argument once and for all when it finally reaches Mount Sharp.